An unnamed “person closely associated with the fund” told Economic Times, “The banks and LIC did not show any interest, some of them rejected contributing towards the fund. Even the supposedly wealthy members of DICCI did not come forward with their investment”. Apart from the initial contribution of 10 crores by Small Industries Development Bank of India (SIDBI), Kamble said the fund managers, Varhad Capital, had contributed Rs5 crores and raised Rs3 crores from HNIs. He also added that he expected another Rs32 crores to be raised in the next six months. He said DICCI would begin investing once the fund reached the 50-crore mark. Kamble did admit though that the DICCI SME Fund had suffered due to the governments at the Centre announcing other similar funds, including the Dalit Venture Capital Fund that was launched by the NDA government in January this year. 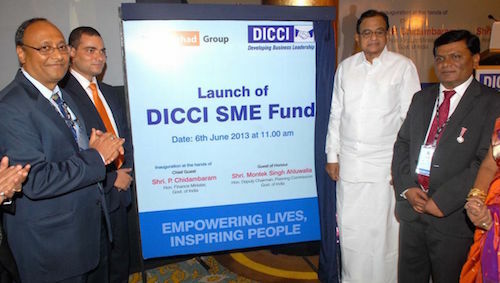 While officially launching the DICCI SME Fund in June 2013, then UPA finance minister P. Chidambaram praised DICCI’s initiative and also promised contributions from government-owned financial institutions such as the LIC but they never materialized. Instead, later, he pledged Rs 200 crores for Dalit-owned Medium, Small and Micro Enterprises (MSMEs) through the Industrial Finance Corporation of India (IFCI), which became the Dalit Venture Capital Fund. The idea behind both of these funds was to help Dalit entrepreneurs take advantage of a policy announced by the UPA government in 2012 that would require all central government ministries, departments and PSUs to make 4 per cent of purchases, in value terms, from MSMEs.